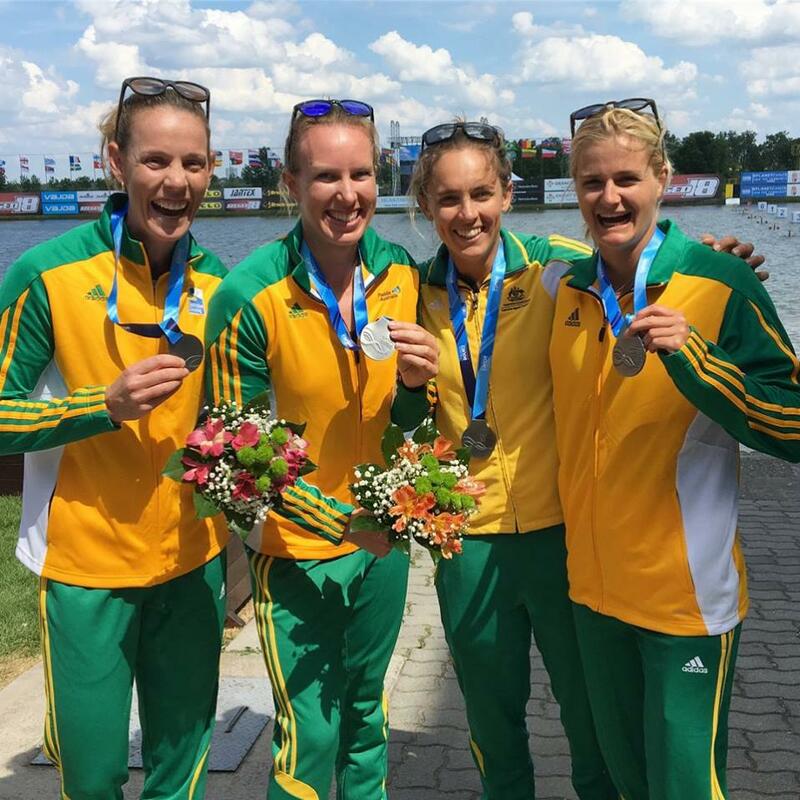 The Australian women’s K4 500 canoe sprint team has shocked even themselves with a stunning silver medal at the ICF World Cup in Szeged, Hungary. The Australian crew, which only came together two months ago, chased the highly-rated New Zealand team to the line, and in the process set the fastest ever time for a women’s K4 500 crew. Alyce Burnett (QLD), Alyssa Bull (NSW) and Jaime Roberts (WA) all paddled together in 2017, and for this weekend they added experienced Olympian Jo Brigden-Jones (NSW). Burnett said in the early days there was plenty of doubt among the crew. “Two months ago after Nationals we decided we would give the K4 a red hot crack, but to be honest when we first jumped in it at the first training camp we were all second guessing ourselves,” she said. “It didn’t gel together quite the way we expected, but I think that probably worked in our favour. We had to work on a few things and go right back to basics, and then work up from there. But the signs were good for the Australians as soon as they took to the water in Szeged, finishing second behind the crack New Zealand team in their heat on Saturday, winning their semi-final on Sunday morning, and then beating everyone but New Zealand in the final. “Honestly our last couple of months with training have been really hard, and we have been working really hard,” Bull said. Brigden-Jones, who was a member of the 2011 crew that set the previous fastest time for an Australian K4, said Sunday’s result is a great start for the new crew. “It feels really good,” she said. “We were kind of struggling when we first got in the boat, but we knew we just had to break it down to build it back up again. In other results on Sunday, Murray Stewart finished fifth in the men’s K1 500, the Australian men’s K4 500 team finished third in the B final, Stephen Bird was eighth in the B final of the men’s K1 200, and Josephine Bulmer was fifth in the B final of the women’s C1 200. The Australian team now heads to Duisburg, Germany, for World Cup 2 next weekend.